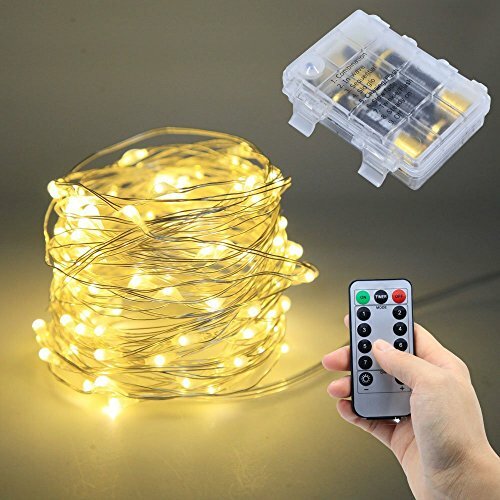 These 100 Micro LED Battery Operated String Lights are perfect for use as Indoor and Outdoor lighting decorative project. The copper wire is flexible, you can bend it to any shape or wrapped it on anything you want like prom dress , trees, flowers , weddings with bouquets. There are many creative ideas of the starry lights for your patio,deck, front porch, room, kitchen, garden. DIY decorate your life and home with the Fairy String Lights with Remote . Perfect Party Decorations - With little twinkling micro LEDs,these starry string lights would be great to decorate your wedding or other events, or just to make twinkling centerpiece for your dinner party. Battery Fairy Lights Box has 8-MODEL OPERATION. Easy Operation: The battery fairy string lights with 13 keys Remote Control, you can easily turn on/off the lights. 8 modes of lighting and flashing available, which are: Combination/In wave/Sequential/Slo glo/Chasing,Flash/Slow fade/Twinkle,Flash/Steady on. Timer Function:(timer + 2 button) To avoid forgetting to turn off the lights, the fairy lights will be 6 hours on and 18 hours off per day. Battery Fairy Lights:Great decoration for Festival, party and xmas gathering, bedrooms, living rooms, gardens, deck, patios, pathways, restaurants, hotels, cafes as well as wedding, Christmas trees, birthday parties ect, all kinds of occasions. If you have any questions about this product by Le Zoey, contact us by completing and submitting the form below. If you are looking for a specif part number, please include it with your message.